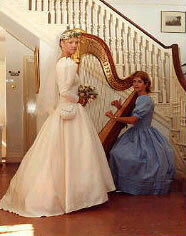 Sarah Deere-Jones is a classically trained harpist with a variety of musical experience and interests. Whilst still performing on concert harp, she has in recent years been concentrating on traditional music, playing Celtic, English and her own compositions for gut strung and wire strung Celtic harps. She also is active in medieval music, playing with the duo 'Lammas' who perform concerts and at historic sites all over the UK. Sarah started her professional life after leaving the Royal Academy of music where she was a prize winner, and played with orchestras such as the Bournemouth symphony, BBC symphony, Tenerife Symphony, Ulster orchestra as well as theatre orchestras such as Festival Ballet, Ballet Rambert, Bolshoi ballet and the English music theatre orchestra at the Aldeburgh festival. She also performed solo recitals at arts clubs across the UK, and on television and radio. Sarah has always loved and played traditional music, despite her classical harp teachers not being very encouraging in the early days! (thats an understatement!). Her first recording Harpsong was a collection of Irish songs and instrumentals where she played her replica Mullagh Mast harp, a rare wire-strung instrument. Later she recorded the music of her home county of Dorset with traditional songs in a CD called " Scenes and Dreams" which included her playing concertina and flute.She recently recorded 'Timing Her' a collection of traditional English acoustic music with her own folk song settings of some of the poems by Thomas Hardy. Sarah never missed an opportunity to go travelling in her career! So after playing in some of the major hotels and clubs across London, she worked in the middle east for around 6 months. This lead to her being invited to play on board the QE2, at the the time the world's biggest ocean liner, and travelled around the world three times playing for the passengers, giving recitals and even having some pupils! In 1997 Sarah began to explore the medieval music repertoire with a view to arranging some songs and instrumentals with her husband Phil, who had since become obsessed by medieval bagpipes, like you do. This lead to them discovering other instruments such as the Hurdy Gurdy, bowed psaltery and hammered dulcimer, purchasing a reproduction medieval pavillion tent, and spending their summers travelling around the historic sites of the National Trust and English Heritage. It has now got completely out of hand, and their duo Lammas (see seperate website www.trehawsa.com) now has over 30 instruments and a trailer load of equipment used in re-enacting! Sarah has always enjoyed teaching, some of her pupils have gone on to become professionals themselves and she has taught age ranges from 6 to 76! She is fascinated by psychology and the learning process and believes that it is as much about confidence and self belief than about playing the instrument itself. As someone who sufferred dreadfully from nerves and self doubt as a student, she is well placed to understand the problems of nervous learners. In 2003 inspired by her move to north Cornwall, Sarah started to set some of the poems by Thomas Hardy to music as 'folk songs' with harp accompaniament. Phil joined her with the cittern, and also on instrumental arrangements with smallpipes and concertina. Sarah went back to the concertina too, this time the Duet concertina with which she accompanies herself singing. The resultant concert and CD 'Timing her' was received with acclaim by the Thomas Hardy society, to Sarah's great relief!